Metro Transit, along with Trailnet and St. Louis Bicycle Works, was recently awarded the top prize in a competition hosted by the New American Road Trip, an electric-vehicle tour that is traveling across the United States to highlight the stories of people and emerging technologies that are helping ensure the nation’s clean energy future. St. Louis was one of just four cities in the country chosen to host a New American Road Trip tour event, which stopped in St. Louis on STL Car-Free Day on Friday, September 21. At a special event in the Cortex Innovation Community, which featured speeches from St. Louis Mayor Lyda Krewson, Cortex President & CEO Dennis Lower, and representatives from Anheuser-Busch, Ameren and IKEA, $10,000 was awarded to local innovators addressing climate change through mobility and transportation solutions. 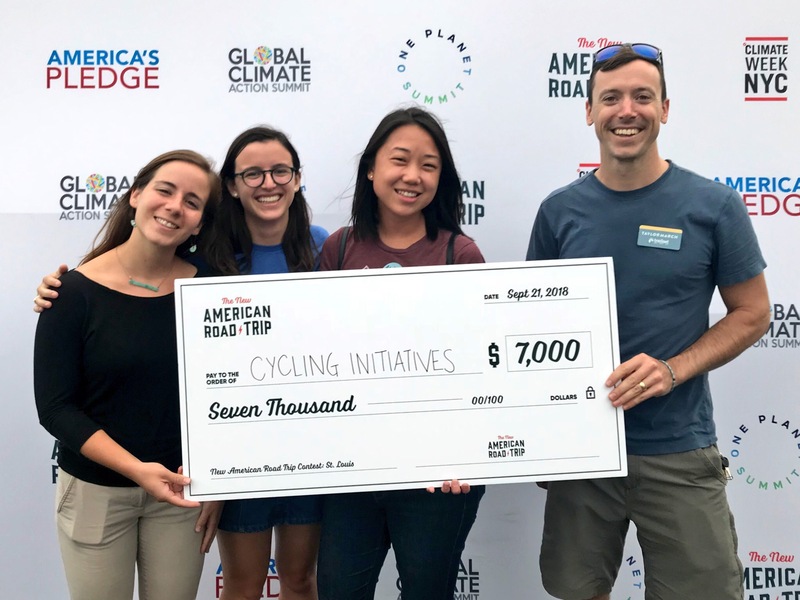 Metro Transit, Trailnet and St. Louis Bicycle Works received the top prize of $7,000, which will be used to further bicycling initiatives in the St. Louis region through education and engagement programming. Bi-State Development, the parent organization of Metro Transit, helped lead the Bike Share Working Group in the refinement of a regional bike share plan. This plan provided a foundation for the City of St. Louis to introduce the region’s first bike-share programs, which launched earlier this year. The New American Road Trip tour began on September 14 at the Global Climate Action Summit in San Francisco, where summit co-chairs California Governor Jerry Brown, UN Secretary-General’s Special Envoy for Climate Action Michael R. Bloomberg, Mahindra Group CEO Anand Mahindra, UN Secretary-General’s Youth Special Envoy Jayathma Wickramanayake and UN Climate Change Executive Secretary Patricia Espinosa presented a call to action signed by city and state officials, and business leaders declaring their commitment to climate action and encouraging more ambitious steps from national and international leaders. “We want to make sure this incredible planet is around for generations, so we need to do our part to live in sustainability, using our energy to the best of our abilities,” said Maggie O’Brien, spokeswoman for New American Road Trip.